Distracted driving is dangerous, claiming 3,166 lives in 2017 alone. NHTSA leads the national effort to save lives by preventing this dangerous behavior. Get the facts, get involved, and help us keep America’s roads safe. Number of people who died in crashes that involved distracted teen (15 to 19) drivers. Percentage of drivers using handheld cell phones in 2017, down from 3.3 in 2016. Will these be your last words? Texting is the most alarming distraction. Sending or reading a text takes your eyes off the road for 5 seconds. At 55 mph, that's like driving the length of an entire football field with your eyes closed. You cannot drive safely unless the task of driving has your full attention. Any non-driving activity you engage in is a potential distraction and increases your risk of crashing. 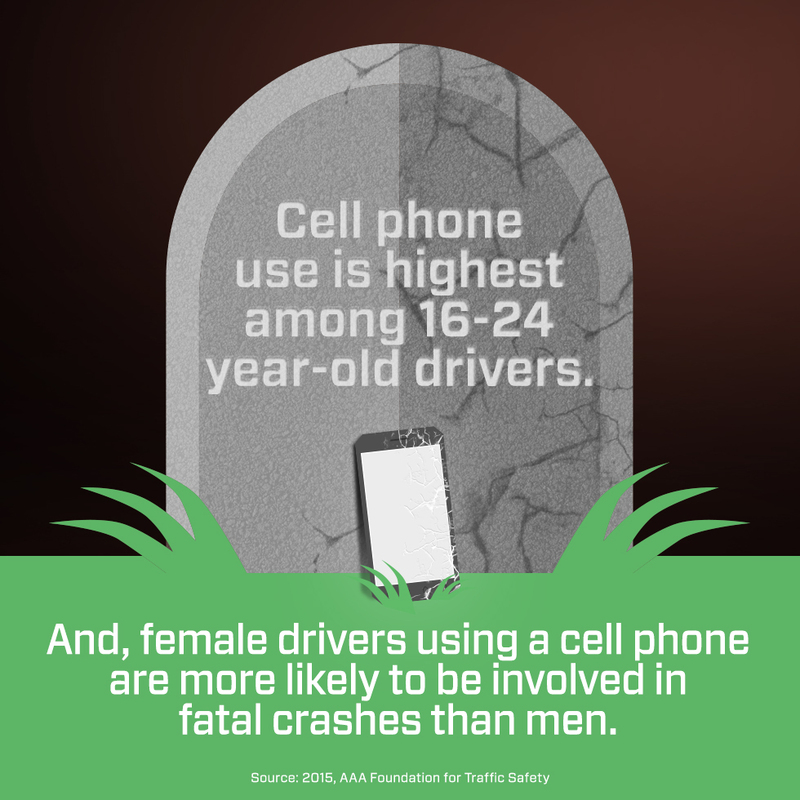 Using a cell phone while driving creates enormous potential for deaths and injuries on U.S. roads. In 2017 alone, 3,166 people were killed in motor vehicle crashes involving distracted drivers. We can all play a part in the fight to save lives by ending distracted driving. Teens can be the best messengers with their peers, so we encourage them to speak up when they see a friend driving while distracted, to have their friends sign a pledge to never drive distracted, to become involved in their local Students Against Destructive Decisions chapter, and to share messages on social media that remind their friends, family, and neighbors not to make the deadly choice to drive distracted. Parents first have to lead by example—by never driving distracted—as well as have a talk with their young driver about distraction and all of the responsibilities that come with driving. Have everyone in the family sign the pledge to commit to distraction-free driving. Remind your teen driver that in States with graduated driver licensing (GDL), a violation of distracted-driving laws could mean a delayed or suspended license. Educators and employers can play a part, too. Spread the word at your school or workplace about the dangers of distracted driving. Ask your students to commit to distraction-free driving or set a company policy on distracted driving. If you feel strongly about distracted driving, be a voice in your community by supporting local laws, speaking out at community meetings, and highlighting the dangers of distracted driving on social media and in your local op-ed pages. NHTSA leads the fight nationally against distracted driving by educating Americans about its dangers and partnering with the States and local police to enforce laws against distracted driving that help keep us safe. NHTSA’s campaigns and public service announcements make the case to Americans that safe driving means driving without distractions. You’ve likely seen or heard our public service announcements, but we’re also on Facebook and Twitter sharing stories and tips to help save lives. The foundation of NHTSA’s efforts on distracted driving and other risky driving behaviors is our partnership with the States and local police. The States determine laws affecting distracted driving, but NHTSA provides Federal investments in the locally driven strategies that address the States’ specific needs. One of the highlights of this relationship comes during April’s Distracted Driving Awareness Month, which pairs a national advertising campaign with a law enforcement crackdown called U Drive. U Text. U Pay. Your State legislature and governor make the laws regarding distracted driving. Many States now have laws against texting, talking on a cell phone, and other distractions while driving. You can visit our State Laws page to learn about the laws in your State. Distracted driving kills and injures thousands of people each year. In 2017, 3,166 people were killed in motor vehicle crashes involving distracted drivers. Don't let an emoji wreck your life. If you're texting, you're not driving. The fight to end distracted driving starts with you. Make the commitment to drive phone-free today. Protect lives by never texting or talking on the phone while driving. Be a good passenger and speak out if the driver in my car is distracted. Encourage my friends and family to drive phone-free.